Perhaps unwittingly, Tennessee's coaches were on to something back in September when they dressed one of their freshman quarterbacks in a cape to play the part of Tim Tebow in practice the week of the Florida game. 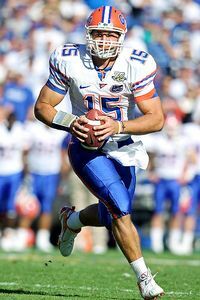 Very few have played the game like Florida QB Tim Tebow. Tebow delivered a Superman-like performance a few days later against the Vols and has played like the Man of Steel ever since, rocketing to the top of the Heisman Trophy charts and keeping the Gators alive and well in the Southeastern Conference's Eastern Division race. Unique isn't the word for Tebow, who's the modern-day version of a single-wing tailback. The difference is that he's packing 235 pounds, can bench-press more than some of his linemen and has already thrown 17 touchdown passes this season. Georgia coach Mark Richt, who gets an up-close view of Tebow on Saturday in the game formerly known as the World's Largest Outdoor Cocktail Party, isn't sure he's ever seen one quite like him. "How many guys are like Tebow?" Richt said. "How many guys are like Tebow in the last 20 years? Guys who were that unique are household names today. Vince Young at Texas was pretty freaky. He could run it and throw it. Michael Vick was that guy. Charlie Ward had some of that. He was a very talented runner, but we didn't run him as much. "There were a lot of guys who could run it pretty well, but not a lot could run and throw. Young could do it. Vick could do it. Tebow can do it. That's what makes him unique." But, remember, even Superman had his Kryptonite. For Tebow, it might be too many glancing blows. If you believe that a quarterback in the SEC has only so many hits he can absorb in a season and still stay in one piece, Tebow is well on his way to reaching that threshold. In seven games, he's carried the ball 125 times (for 578 yards and 10 touchd owns). The SEC record for most carries by a quarterback in a season is 190 by Mississippi State's Don Smith in 1985. Tebow has run the ball 100 times in his last five games. He toted it 20 times last week against Kentucky and exited that game with a bruised right (non-throwing) shoulder. Think the Georgia defenders might favor that side when they're zeroing in on Tebow at Jacksonville Municipal Stadium on Saturday? "If they come after my shoulder, then I guess they will not be hitting me straight up and I will have a very good chance of breaking that tackle," Tebow said. "I'm not too worried about it." Others are, notably Florida coach Urban Meyer. His preference is for Tebow to run somewhere around 10 times a game. Meyer's quarterback at Utah in this same spread-option offense, Alex Smith, had 16 or more carries in only three games during his last two seasons. Tebow has carried it 16 or more times in every game but one this season. "A lot of them aren't designed quarterback runs," Meyer said. "He just pulls it down. We have to be careful, but we also have to continue to coach him up that, if it's there, just manage the game. We've just had so much success that if it's flip it for a 5-yard gain or him take it for a 5-, 6- or 7-yard gain, he just has the kind of persona that just takes it." It's also the kind of persona that might find him dodging more doctors than defenders the rest of the way. "I think, from week to week, it's going to be very, very hard to keep him healthy in this league if he's going to carry it 20-plus times a game," Kentucky coach Rich Brooks said. Former Mississippi State quarterback John Bond knows a little something about the steep price so many hits can take on a quarterback's body. He was the SEC's all-time leading rusher for a quarterback (2,280 yards from 1980-83) until Arkansas' Matt Jones broke his record in 2004. Jones, now playing receiver for the Jacksonville Jaguars, wound up with 2,535 yards. But whereas Jones had 382 rushing attempts for his career, Bond had 572 -- far and away the most ever for an SEC quarterback. Tebow, in just seven career starts, already has 214 attempts (for 1,047 yards). "You've got guys falling on you and landing on you," said Bond, who ran a version of the wishbone offense. "The wear and tear when you're running it that much catches up with you. When I came to State, I was running a 4.4. When I left, I was probably running a 4.6. "The thing that all that beating on you does, too, is that it affects your passing. You've got to use your whole body when you're throwing the football, and it's hard to do that when you're favoring something. I probably shouldn't have played the last half of my senior year. My whole left side was shot from my shoulder all the way down to my elbow. I had a slipped disc and a ruptured disc in my back. "I was like a pin cushion." Nearly 25 years later, Bond still feels all those aches and pains. He cringes when he sees Tebow get hit, but loves watching him play. The hits have been piling up on Florida QB Tim Tebow. "He's as tough as they come and wants the ball in his hands, either running it or throwing it," said Bond, who played at about 225 pounds his senior season and ran for 13 touchdowns. "That's what college football's all about, watching that quarterback pull the ball down and make plays like that. "I know they don't want to get him hurt, but the tough part is that they're not nearly the team they are without him being such a threat to run the ball. If that quarterback's not a threat to run at the college level, then you're playing 10 guys versus 11." 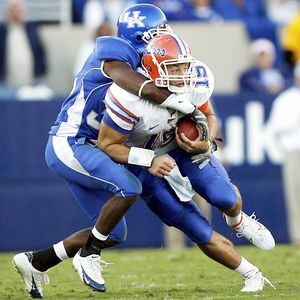 Florida's players say teams have already tried to knock Tebow out this season. Receiver Percy Harvin said LSU's defenders were trying to twist Tebow's legs at the bottom of piles and were also dragging him and falling on top of him. Tebow, whose 327 yards of total offense per game is higher than 19 entire teams in Division I-A, promises to be smarter the rest of the way when it comes to taking unnecessary hits. But he's not going to change the way he plays, which means he's not going to quit running. "I don't think you can worry about it or think, 'I'm taking too many hits or I need to get down or something,' " Tebow said. "When you play like that, then you have a much greater chance of getting hurt or getting injured when you're thinking about it and not going out there and playing the way you know how to play. "I'm just trying to get first downs and put points on the board." After all, how many quarterbacks can run their own play-action? Similar to a year ago against LSU, Tebow pulled off a fake quarterback draw and jump pass for a touchdown against Kentucky last week. It had sandlot written all over it. Better yet, it had Tebow written all over it. "That's the beauty of their whole offense. It's simple," Richt said. "They've got you outnumbered on every play with Tebow on the field." The tricky part for the Gators may be keeping him on the field. Chris Low is a college football writer for ESPN.com.